Christmas tree comes fully decorated with ribbon, 24 shatterproof ornaments, 12 glittery snowflakes, 12 poinsettias, 24 bows & warm yellow lights. 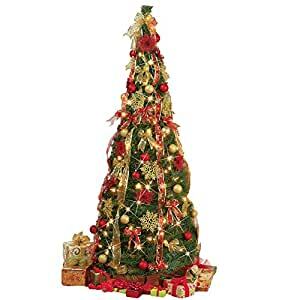 Decking the halls doesn’t get much easier than this impressive Christmas tree that comes fully decorated with festive gold and red ribbon, 24 shatterproof ornaments, 12 glittery snowflakes, 12 red poinsettias, 24 bows and warm yellow lights. Simply lift it up, assemble the stand and plug it in for a beautiful display. Collapses for easy storage. Iron, plastic and styrofoam. 27″Dia. x 72″H.